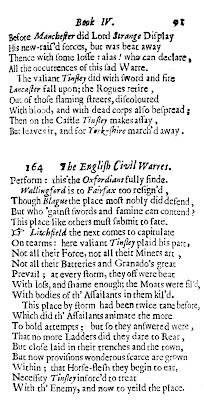 In 1660, Andrew Cooper, a Royalist reporter and poet published Stratologia, or, The history of the English civil vvarrs in English verse : containing a brief account of all fights, most skirmishes, stratagems and sieges in England, from the very first originall of our late warres, till the martyrdome of King Charles the First of blessed memory by an eye-witnesse of many of them, A.C.
Stratologia contains four mentions of "Tinsley"—Sir Thomas Tyldesley 1612-1651. Tinsley is a phonetic spelling based on the local dialect pronunciation of Tyldesley. All the occurrences of this fad Warre. 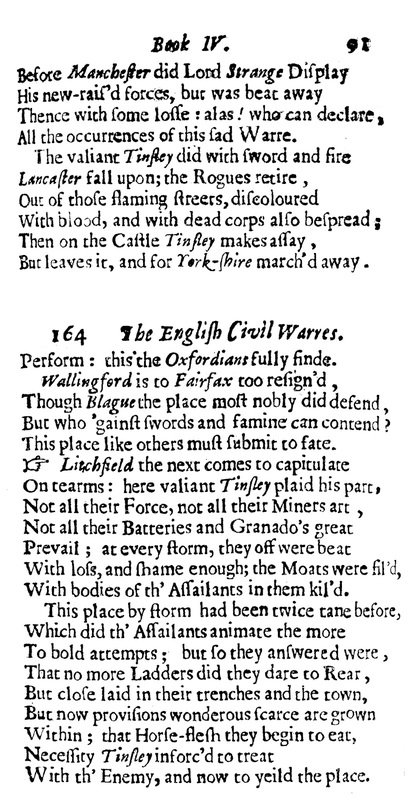 But leaves it, and for York-fhire march'd away. Perform : this the Oxfordians fully finde. But who 'gainft fwords and famine can contend? This place like others muft fubmit to fate. With bodies of th' Affailants in them kil'd. With th' Enemy, and now to yeild the place.